NEW YORK — Policymakers in Mayor Michael Bloomberg's administration have been discussing whether it would be possible to extend the No. 7 subway line under the Hudson River to New Jersey, a city official said Tuesday. But there are major logistical, financial and political hurdles that would need to be overcome. The estimated $5 billion to $6 billion plan would be about half the cost of a proposal to build a second commuter rail tunnel under the river that was killed last month by the Garden State's Republican governor, Chris Christie, because of potential cost overruns. The alternative idea to extend the No. 7 line would cost less because the city is already digging a tunnel to run the subway from Times Square to West 34th Street and 11th Avenue, said Andrew Brent, a spokesman for the deputy mayor for economic development, Robert K. Steel. Extending the line beyond the city for the first time, under the river from Manhattan's West Side, through Hoboken, N.J., and on to Secaucus, N.J., would save money, he said. "Like others, we're looking at — and open to discussing — any creative, fiscally responsible alternatives," Brent said. "Extending the 7 line to New Jersey could address many of the region's transportation capacity issues at a fraction of the original tunnel's cost, but the idea is still in its earliest stages." The idea was first reported by The New York Times on its website Tuesday. Before it goes anywhere, the plan would have to be supported by Christie, Bloomberg, an independent, and New York Gov.-elect Andrew M. Cuomo, a Democrat. A spokesman for Cuomo didn't immediately respond to an e-mailed request for comment. Christie spokesman Michael Drewniak said the New Jersey governor would listen to new ideas to solve the "trans-Hudson transportation dilemma." "But — and this is a big but — any plausible plan would ... have to be fair to New Jersey as far as cost sharing between all benefiting jurisdictions," he said. New York's U.S. Sen. Charles E. Schumer, a Democrat, offered his support in obtaining federal funds to make the idea work. "This is a bold idea that must be given serious and immediate consideration," he said in a statement. None of the stake holders has been briefed about the idea, Brent said. It emerged out of discussions among policymakers in Steel's office, the city's Department of Planning and the city's Hudson Yards Development Corp. after Christie killed the plan for the so-called Access to the Region's Core project. The $8.7 billion project to construct a second rail tunnel between New Jersey and New York was 15 years in the making when Christie killed it on Oct. 27. New Jersey was expected to shoulder $2.7 billion of the costs, plus overruns. The federal government and the Port Authority of New York and New Jersey had each committed $3 billion to the project. TARRYTOWN – Last week, it was Sing Sing prison, just up the Hudson River from the Tappan Zee Bridge. Monday, it was the bridge, itself that incoming Governor Andrew Cuomo toured, getting a water-level look at the 55-year-old span. “It looked good to me,” Cuomo said, conceding he’s not the expert. He said a lot of work has been done to maintain the bridge, but, he added, the Tappan Zee typifies chronic problems with many of the 17,000 bridges across New York State. Two years ago, the state unveiled a broad plan to replace the span with a new complex of bridges that would carry both normal vehicular traffic, but with dedicated portions of the new structure for mass transit, both bus and rail. The current cost estimate is about $16 billion, for a state with a growing deficit. Whether a new bridge is built, or not, does not change one certainty, said Cuomo. When the Tappan Zee was built in the 1950s, it carried fewer than 20,000 vehicles a day. Now, that volume is closer to 180,000 each day. The leak, noticed late Thursday night, was contained by early Friday morning. LOWER MANHATTAN — A concrete wall that keeps the Hudson River at bay near the World Trade Center sprung a leak Thursday night. The leak was noticed about 11 p.m. Thursday when 2 feet of water filled a construction pit near Vesey Street just west of West Street, said Steve Coleman, spokesman for the Port Authority. The FDNY responded and contained the leak by about 1 a.m. Friday, Coleman said. The water flowed through a small crack in a concrete retaining wall that was built to keep the Hudson River back during the excavation of a pedestrian tunnel beneath West Street, Coleman said. When the tunnel is complete, it will allow people to walk belowground between the World Financial Center and the World Trade Center. Brookfield Properties, owner of the World Financial Center, is building the tunnel from the west side, while the Port Authority is building it from the east. The leak happened on the west side, an area under Brookfield’s control, Coleman said. Because the tunnel does not yet go all the way through, there was no danger of the World Trade Center site flooding, Coleman said. A spokesman for Brookfield Properties said the leak may have started because the grout the workers put in the wall did not fully seal it. "It is my understanding that this is not all that unusual and a fairly minor issue," said the spokesman, Matthew Cherry, in an e-mail. There were no injuries or traffic impacts, the Associated Press reported. The Occupational Safety and Heath Administration may investigate the incident, Coleman said. 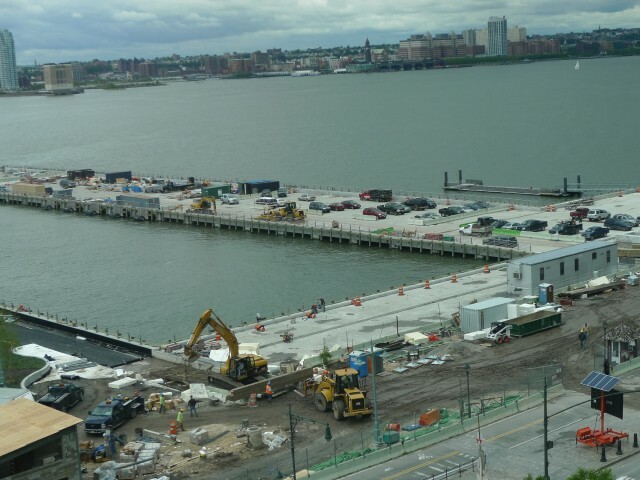 TRIBECA — A temporary maritime education center could open on the new Pier 26 as soon as 2012. The center will likely host scientists from the City University of New York, who will conduct experiments in the Hudson River, said Ronald Spalter, deputy chief operating officer for CUNY. CUNY also hopes to work with local nonprofit The River Project to teach visiting schoolchildren and members of the public about the scientists' research. "We want to bring people from the city to [Pier 26] so they can understand what science means and how it plays a role in their lives," Spalter said at a meeting of Community Board 1’s Waterfront Committee Monday night. "It’s a perfect match." The center would be a low-cost placeholder until the Hudson River Park Trust raises at least another $10 million to build a long-planned permanent, maritime science center, called an estuarium, on the pier. The trust already has $5 million and some planning money for the estuarium, but it could take years for the rest of the money to come through, said Noreen Doyle, executive vice president of the trust. In the meantime, the trust will likely allow CUNY to use the space on the pier that would otherwise sit empty, Doyle said. But the trust will not provide a building and may not even be able to give CUNY electricity. Fortunately, CUNY students are already designing an 800-square-foot off-the-grid green building as part of the US Department of Energy’s Solar Decathlon. That building could later be reassembled on Pier 26 and serve as CUNY’s headquarters there, Spalter said. The center would join a boathouse and a cafe that are also opening in 2012 on the pier. Members of CB1’s Waterfront Committee were pleased to hear of the project Monday night, though some worried that the permanent estuarium would never get built. "Every time we talk about it, it seems to disappear farther away," said Joe Lerner, a committee member. Still, committee chairman Bob Townley called the proposal "wonderful." "I hope you can pull it off," Townley said. TOWN OF ULSTER - A construction road officially opened today leading into a site where a large-scale housing complex is to be built on the Hudson River banks over a 15 year period. About 50 people gathered during a road opening ceremony off state Route 32 in the town of Ulster, near Frank Sottile Boulevard. The road will carry construction vehicles to the site where the Hudson Landing, a 1,658-unit housing complex, is to be built. "I have never been prouder to be the mayor of Kingston than i am right now," said Mayor James Sottile, who has been a strong supporter of the housing project first proposed eight years ago. Before AVR Acquisition Corp. of Yonkers can start building the development it will need to get site plan approvals for the first phase of the project. No plans have been submitted to Kingston's Planning Office. Developers gave no timetable today on when those plans would be submitted. Two Operators Interested In Warren County"s "Train To Nowhere"
The end of another season on the Upper Hudson River Railroad is just days away, but Warren County officials say there are signs that the railroad's best days may not be too far off. That's because a "request for proposals" from new prospective operators has generated a lot of response, to the point that the county will to put out another RFP later this month to answer all of the questions the would-be operators have had. "There's been a lot of interest," said Julie Pacyna, the county's purchasing director. The county has a contract with the current operator of the North Creek-based railroad through the end of the year. The controversial railroad has been dubbed the "train to nowhere" by critics who believe the money spent on it has been wasted. Many supervisors have not been happy with last few years of operation by W.J. Riegel & Sons Railroad of Selkirk. They believe the company has not been responsive to requests by county leaders to increase trips and use the southern portion of the line more often. The Board of Supervisors rejected a contract extension with the company earlier this year. That rejection was followed by a public meeting at which three railroad companies made presentations to supervisors and expressed interest in running a railroad on the line. Two of them were large operators who run rail lines in the Midwest and New England. The two large operators have since come to Warren County to check out the tracks, meeting with leaders in communities along the rail line and exploring the possibilities of resuming freight train traffic. "They've been asking about historical landmarks and events," Pacyna said. "They're doing their homework, they really are." Another New England rail line operator also recently began expressing interest in the Warren County line, she said. The inquiries and questions have prompted the county to revamp and extend its RFP, said county Administrator/Attorney Paul Dusek. "We have had quite a bit of interest," he said. Johnsburg Town Supervisor Sterling Goodspeed, in whose town the railroad is based, said he believes the railroad "is at the cusp of providing a real commercial catalyst to the Adirondack economy." He said Barton Mines is one of a number of businesses in the county that have expressed interest in using freight trains on the Warren County line, and he said that a change in the way the country transports goods will result. The Warren County line now connects to Saratoga County's, which links to Saratoga Springs and the main rail line. Goodspeed said the fact that "major players" in the railroad business have interest in the line shows the possibilities. "I know the railroad has been controversial, but I think there's light at the end of the tunnel. And I think it's a train," he said. County leaders hope to meet with the would-be operators later this fall or early winter, and to have a contract for next spring. UHRR has been operated by Riegel for 12 years. John Riegel, president of UHRR, said he plans to seek the contract for next year. He said he would offer more trips and special events next year, particularly on the southern portion of the line, and would offer freight trains if needed. The Saratoga County connection was just made this year, so, he said, the freight train wasn't an option until now. "We are capable and ready for freight," he said. He said he was well aware of criticism of his company and he has tried to "mend fences" with county supervisors. "They're critical, but I'm a businessman and I'm trying to keep everyone happy," he said. The county had planned to have a new platform in Stony Creek in place for next season, but that stop at Thousand Acres Ranch looked to be in doubt late last week. The Board of Supervisors approved the new platform last spring, with $33,000 in state grant money to be put toward the project. It would require the ranch's owner, Jack Arehart, to give the county an easement on the property. But months after the board approved the platform, Arehart has refused to sign the easement paperwork, county officials said. Geraghty said he talked to Arehart, and his concern is that he doesn't want the easement to be permanent, in case he wants to sell the property and would-be buyers didn't want the easement. Dusek, though, said easements are permanent. And the time to get the project done this year, which the grant requires, has passed. "Even if he says yes now, we may not be able to build it," Dusek said. Arehart did not return a phone call for comment Friday. The county was looking into whether it could get an extension on the grant, so that if work was started this year it could be completed next year. But Dusek said officials had not gotten an answer as of late last week. http://www.poststar.com. Copyright (c) 2010, The Post-Star, Glens Falls, N.Y.
call 866-280-5210 (outside the United States, call +1 312-222-4544). For full details on (ZZBPR) ZZBPR. (ZZBPR) has Short Term PowerRatings at TradingMarkets. Details on (ZZBPR) Short Term PowerRatings is available at This Link. (Reuters) - One of the biggest U.S. transport projects ended on Thursday after New Jersey's governor said the state could not afford the risk that a new rail tunnel under the Hudson River could cost billions more than planned. Republican Governor Chris Christie, who took office in January, said the $8.7 billion budget for the tunnel between New Jersey and New York City's midtown Manhattan could rise to more than $11 billion and even surpass $14 billion. "We simply can't spend what we don't have," Christie told a news conference. "I had to figure out how I was going to pay for it. We simply can't." Christie inherited the tunnel project from former Democratic Governor Jon Corzine. He halted work in mid-September for 30 days and asked his staff and federal transportation officials to review the cost estimates. Under the original deal, the federal government and the Port Authority of New York and New Jersey were each to pay $3 billion, with $2.7 billion coming from a combination of other federal funds, including stimulus and clean air funding, as well a contribution from the New Jersey Turnpike Authority. But crucial to the funding plan was that New Jersey was to pay anything above the $8.7 billion estimate. 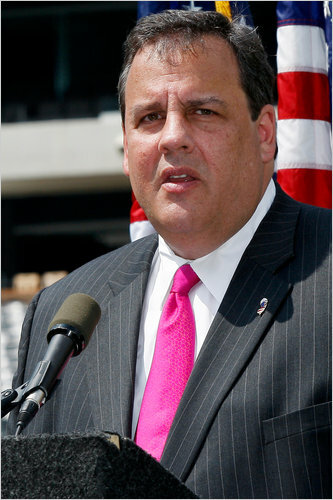 U.S. Transportation Secretary Ray LaHood requested to meet with Christie after the governor told him of his decision. The meeting is scheduled for Friday in Trenton, the governor's spokesmen said. Christie's decision means no contract has been signed for completion of the project and the federal funding was not secured. The Port Authority of New York and New Jersey and New Jersey Transit both declined to comment on the termination of the project. New York Governor David Paterson said he was disappointed but respected Christie's decision and understood "the difficulty of governing in our current economic climate." Christie has garnered national attention for progress made tackling the state's record $11 billion budget deficit during his first year in office. He has been invited by other Republicans across the country to campaign for them ahead of the November 2 congressional elections in a multi-state tour that has added fuel to speculation that he might consider a presidential run. Christie is pushing a lean-government, low-tax agenda that includes limiting annual increases in the state's property taxes, the highest in the nation. He has refused to raise money by increasing taxes on gasoline, among the lowest-priced in the country. New Jersey Democratic Party Chairman John Wisniewski said there was no evidence that the Hudson River tunnel would exceed its estimated budget and accused Christie of canceling the project in a bid to fuel his growing national profile. "It fits with his national agenda," Wisniewski said. "There is no better time to get public works projects than now and the governor is throwing away this opportunity." One century-old Hudson River commuter train tunnel runs between New Jersey and Manhattan's Pennsylvania Station. Transit advocates say the tunnel is so overcrowded that commuters frequently endure long delays. Christie had repeatedly stressed that New Jersey is too cash-poor to pay for any cost overruns by itself. New York Mayor Michael Bloomberg, who supported the project, has said the city did not have money to contribute to the project. 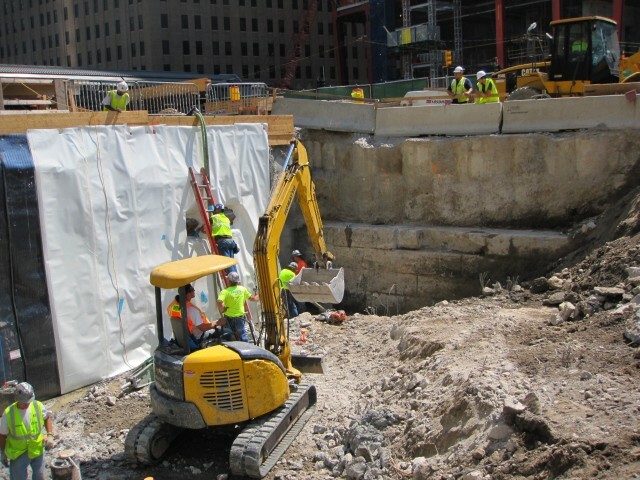 Digging for the tunnel, which was estimated to create 6,000 jobs, began in June 2009. It was to open in 2018. Critics have called Christie overbearing and confrontational toward the New Jersey state legislature, which is Democrat-controlled. But his fans praise his straight talk, his forceful style and his record of getting things done. Gov. Chris Christie ordered a review of the tunnel's cost, now estimated at $8.7 billion. Advocates for the project, which would add a second pair of tracks between New Jersey and Manhattan, say it will reduce traffic congestion and pollution, shorten commuting times, increase suburban property values and create 6,000 construction jobs. Before Mr. Christie became New Jersey’s governor in January, the state’s elected officials had already lined up $6 billion for the project from agencies outside the state. Despite everything that the project appeared to have going for it, Mr. Christie ordered a review this month of the tunnel’s cost, a move that many supporters of the project worry could signal its undoing. During the 30-day review, digging will continue on the New Jersey side of the river, but no new work will begin. “If I can’t pay for it, we’ll have to consider other options,” Mr. Christie said last week. On Friday, New Jersey’s two senators, Frank R. Lautenberg and Robert Menendez, and several other Democratic officials appeared at the site where digging began last year and urged the governor to reconsider. “Don’t throw away $6 billion; don’t throw away thousands of jobs,” Mr. Lautenberg said. If state officials conclude that the project will cost significantly more than the latest estimate, $8.7 billion, advocates fear that Mr. Christie will withdraw some or all of the state’s share of that total and redirect it to highway repairs and other transportation projects, putting the tunnel at risk of being delayed or even scrapped. Giant public works projects are infamous for costing far more than projected — the “Big Dig” highway tunnel in Boston cost more than twice what was initially estimated — but the Hudson tunnel project, which broke ground last summer, has not run over budget. Still, even some ardent supporters expect that it will. “It’s obvious there’s going to be a couple billion dollars’ shortfall,” said Raymond J. Lesniak, a Democrat who is chairman of the Economic Growth Committee of the New Jersey State Senate. But Mr. Lesniak said the state should find a way to come up with the additional money rather than “let that kill this project.” He said Mr. Christie’s decision to halt the project and review its cost was irresponsible because it could set back the schedule by several months. Mr. Lesniak suggested covering the excess costs by charging $2 per ticket to commuters who use the new tunnel. But that money would not be collected for at least eight years because the project is scheduled to be completed in 2018. On Thursday, the governor discussed the project with Ray LaHood, the federal transportation secretary. “Given that this project represents the single largest transit investment ever made by the Federal Transit Administration, the secretary and governor agreed to have staff work together to further refine the estimated cost of the entire project,” said Brian Farber, a spokesman for the transit administration. The federal government has agreed to match the $3 billion that the Port Authority of New York and New Jersey pledged to spend on the tunnel. But that carefully constructed financing plan could still unravel because the project’s planners have not yet awarded contracts to dig under the river and through the bedrock of Manhattan to create a station deep below 34th Street. Zoe Baldwin, the New Jersey advocate for the Tri-State Transportation Campaign, described the review as “a very, very bad sign for the project.” She said she would be “shocked” if the governor’s move did not at least stretch out the timetable for completing the work. Ms. Baldwin said the prospect of passing up the $3 billion that the federal government had offered reminded her of the New York Legislature’s rejection of a congestion pricingsystem in Manhattan. That decision cost New York State $365 million in federal funding, Ms. Baldwin said. Scrapping the Hudson tunnel would be much costlier for New Jersey and the region’s economy, she said. But some commuter-rail advocates greeted the governor’s review as an opportunity reborn. Jeff Tittel, the director of the Sierra Club in New Jersey, said state and federal officials should use the “time out” to reconsider the configuration of the project. As proposed, the new tunnel would take trains from throughout northern New Jersey to a station more than 100 feet below street level at the foot of Macy’s flagship store on 34th Street. Those tracks would not connect to Pennsylvania Station, a block away. Mr. Tittel is part of the vocal camp that has argued that the new tunnel should connect to Penn Station, as it was originally designed to do. The National Association of Railroad Passengers last week urged commuters to tell their elected officials that the tunnel project was vital to the region, but that it must connect to the station. Mr. Tittel pointed out that Amtrak, which owns Penn Station, had drawn up a long-term capital plan that called for a separate new tunnel under the Hudson River, at an estimated cost of $11 billion. That plan assumed that the New Jersey Transit tunnel would be built first. But Mr. Tittel argues that there must be a way to build one set of tunnels that would meet the needs of both railroads. Despite the continuing swirl of opinions about how and whether to provide commuters another way into the city, there is one point on which almost all supporters and detractors agree: Unless Mr. Christie expresses strong support for the project after the review is over, the tunnel known as the Trans-Hudson Express is not going anywhere anytime soon.